Disney’s Frozen continues to be a big hit with young girls, my daughter for one is a fan and I’m forever hearing the words to ‘Let it Go’ being sung around the house. 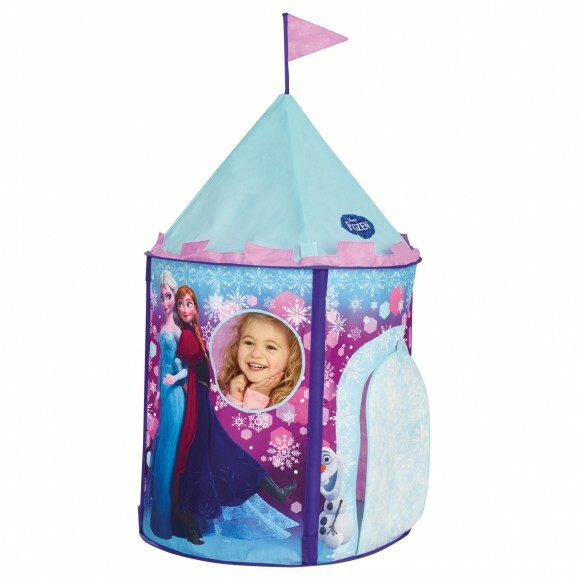 One thing I’m sure any little Frozen fan would love to play in is the Disney Frozen Play Tent from World’s Apart. Suitable from ages 2+, the tent simply pops up and some poles are simply inserted and it’s ready for play. With an opening door, I can imagine children loving to hide in here or use it for plenty of imaginative play. This entry was posted in Giveaways and tagged disney, frozen, play tent, worlds apart by Fiona Martin. Bookmark the permalink. Have to be love actually because I love Hugh grant! it’s a wonderful Life – It feels it’s really what Christmas is about. I love A Christmas carol – maybe it is because I am fascinated with ghosts? I watch all the versions over Christmas! It is a lovely story! the holiday – would love to be in this film! Elf its so so funny! Love the snowman too – it reminds me of being little! We love Santa Claus the Movie. It’s a tradition for me. I watched it every year on the twelfth day of Christmas, and now so does our little girl – we know that’s the time to start getting excited! It’s an old fashioned Santa-fest with a lovely festive, fun storyline and perfect for all ages. Donna @ Little Lilypad Co recently posted…On the seventh day of Christmas …. Annie. because I’m oldskool, and it’s a great singalong. ELF , because it makes me laugh out loud , and gets me in the festive spirit . Trading Places – a lot of lessons for all of us to to learn in a fun way! Muppet Christmas Carol… Just so fab and good for all ages!!! Its A Wonderful Life, it is just reminiscent of days gone by and I cry everytime. Remember ”Every time a bell rings and Angel gets its wings” ! Elf. It’s funny but it also has a good message behind it. Jack Frost perfect mix of tears and laughter fab film! I love the both Polar Express because hubby and I sometimes take our little on a local train ride. I find the film magical and love it. Another film I love is A christmas story because it reminds me of my family back in Ohio, USA. I love so many Christmas films but my favourite has to be Scrooged. It’s a real Christmas feel good movie. It’s a wonderful life – it’s festive without being sickly sweet! I love a classic, so it would have to be ‘it’s a wonderful life’. The Muppet Christmas Carol. It has become a yearly tradition. ELF because its a very good comedy as well as Christmas themed without being too sickly and over emotional. Frozen because of the great music! Massive fan of Elf, so funny! There are so many possibilities. The Muppets Christmas Carol is one of the best versions of that classic story. I’m always surprised how authentic they made it. I love The Wizard of Oz because it was always shown at Christmas when I was a child and every year the whole family would sit down and watch it. Muppets christmas carol. It’s a family tradition to watch on Christmas Eve. We watch The Polar Express every year when we put the christmas tree up, it is a magical film. holiday inn because of the carol white Christmas one of the best songs ever composed !! White Christmas as I am addicted to all the old musicals & have a huge collection. A Christmas Carol, I love the story! Miracle on 34th Street, its just a perfect weepy, guaranteed happy ending perfect movie for sunday afternoons leading up to crimbo!!!! Home Alone as its funny and suitable for all the family! Elf because its so funny! Home Alone, as I enjoyed watching when I was younger and it a good family funny film to watch with my children. A muppets christmas carol, such a lovely christmas film! Love Actually is mine because it’s romantic and festive. Elf as is so funny to young and old! National Lampoons Christmas Vacation. It’s hilarious! Elf, my favouite film ever! So funny. Muppets christmas Carol……makes me laugh everytime! I still love Home Alone! Home Alone cracks me up ! I think mine is Love Actually. It’s a great feelgood funny film to curl up on the sofa later in the evening with. Tim Burton’s Nightmare Before Christmas – it has an evil touch with a Christmassy theme! Santa Claus: The Movie – Watched it every christmas eve growing up, had to buy the DVD when they stopped showing it on tv on christmas eve to continue the tradition! Jingle all the way, everything just goes wrong because he forgot to buy the toy, but has a lovely happy ending. So many to choose from! We do make a point of watching Jingle all the way every Christmas – it’s a great family film! muppets christmas carol, its a classic!! chantelle hazelden recently posted…November’s Degustabox, What’s Inside? It’s a wonderful Life – It really makes you appreciate the small things in life. Ohhh elf or the Grinch …. I’m going to say Elf! National Lampoon’s Christmas Vacation because every family has elements of the Griswolds! I love National Lampoon’s Xmas Vacation – reminds me of the mishaps my family had when we were growing up, including forgetting to even buy the veg!! We had turkey/stuffing and baked beans!! Its got to be The Lion, the Witch, and the Wardrobe, going through a wardrobe a wonderland out of sight! to see the snow glistening, windows Cold as cold could be, the snow queen in all of her glory, snow covered landscapes very bright, streams not flowing covered in ice, and no passing of time. Think Disney frozen is the new Christmas Classic!! I love the Grinch it’s a traditional!! Scrooge just love all the different versions of it. Bad Santa because it’s not sugary sweet like most Christmas films. Miracle on 34th street – Wish I could play a part in its sequel, if ever ! Jingle all the way, so funny they way they fight over the turbo man toys, because it’s exactly the same with the Frozen toys now! I love ‘A Christmas Carol’ because I feel so sorry for Ebenezer Scrooge as a child who was mistreated by his father at Christmas…and I love all things Charles Dickens! i love the first home alone – why? because its funny and brings the inner child out in me. How The Grinch Stole Christmas, I love Jim Carrey and one of my favourite movie quotes of all time is 1) He puzzled and puzzed till his puzzler was sore, then he thought of something he hadn’t before. 2)Maybe Christmas doesn’t come from a store. Maybe Christmas perhaps means a little bit more. The Muppets Christmas Carol because I love Kermit. It has to be ‘it’s a Wonderful World’. Can’t beat a good old fashioned classic. ‘Elf’ – a family favourite that we never tire of watching! Love Actually. It’s so funny and never gets old. Has to be Elf for me, children and adults love it, me most of all, and I am 67!!! home alone , its a classic!! Elf, Will Ferrell is so cute. Miracle on 34th street, always thought the santa was real when i watched it as a child . National Lampoons Christmas Vacation. It’s just so funny you have to laugh. Home Alone 2 – Lost In New York because we has sailed into New York loads of times at christmas . Scrooged because it makes me laugh. Elf – as it gives the whole family the giggles! Scrooge-a Christmas Carol made in 1951. I watch it every year it reminds me of my happy childhood days watching Christmas films, and I love Alistair Sim. Pleased to say it’s on again this year! Miracle on 34th street is by far my fav I always wished to see a santa like the santa in the film. His the kind of santa everyone imagines him to be. Jingle All The Way, it’s such great fun. Elf – its cute and funny! The Muppets Christmas Carol because the Muppets Rock! The Santa Clause. I always watched it with my family every Christmas Eve as a young girl and it really built the excitement up for Father Christmas coming. I’ve carried on this tradition with my own children now and will carry it on for years to come! Home alone as all the family loves it! Home Alone, me and my brother always used to sit and watch it together every Christmas. I still have to watch it every year to get into the Christmas spirit. The Grinch it’s just so over the top! The Snowman. I love the music. The Muppets Christmas Carol because I loved the Muppets when I was growing up. Scrooged, because I love it and watch it every year. It’s so funny and has a lovely christmas message too. Mickeys Christmas carol, fell in love with this disney version when I was a child and its tradition to watch it every christmas eve now, must have gone through several tapes of it as a few years had to watch it every day. National Lampoons Christmas Vacation – hilarious! It’s a Wonderful Life because it makes you think about your life.